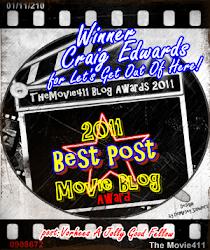 Maniacal Movie Poster Monday #161! 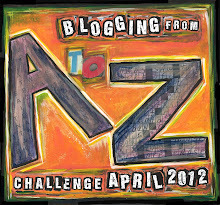 I'm gearing up for my fourth annual A-Z Blogging Challenge - where I'll be posting every day in April (except Sundays). So here's a quick three! 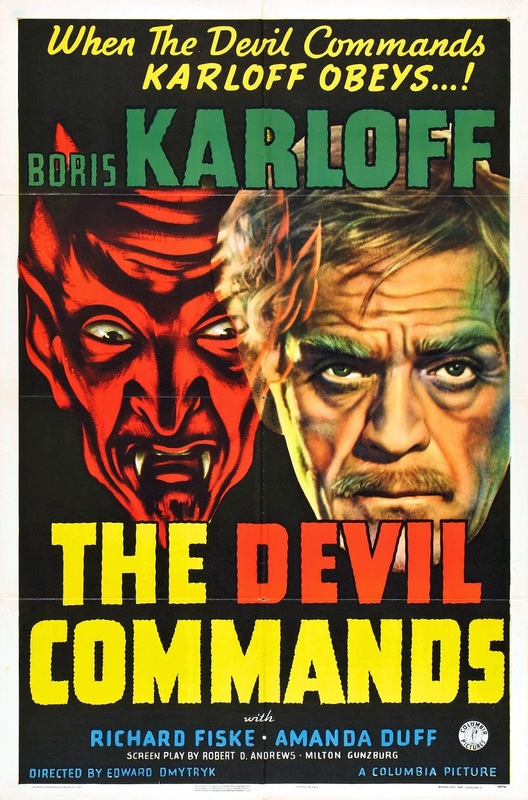 Boris Karloff spent what seemed to be a lot of the 1940's playing scientists - sometimes mad, sometimes kindly, sometimes misguided - but whatever his experiments were things always went wrong. This time out he's trying to contact his dead wife through technological necromancy. I haven't seen this one - but I certainly want to! 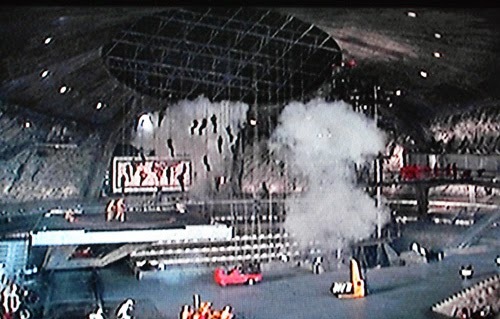 This is the second of The Asylum's...er...homages...to Michael Bay's big budget toy commercials. I think this one has ended up in the video vault on a multi pack - so I'll be watching it one of these days. (Little secret...not dreading it...I have a grudging affection for The Asylum). This Italian action flick from director Bruno Mattei (yeah, right, "Vincent Dawn") apparently never played American theaters, but went straight to video courtesy IVE. 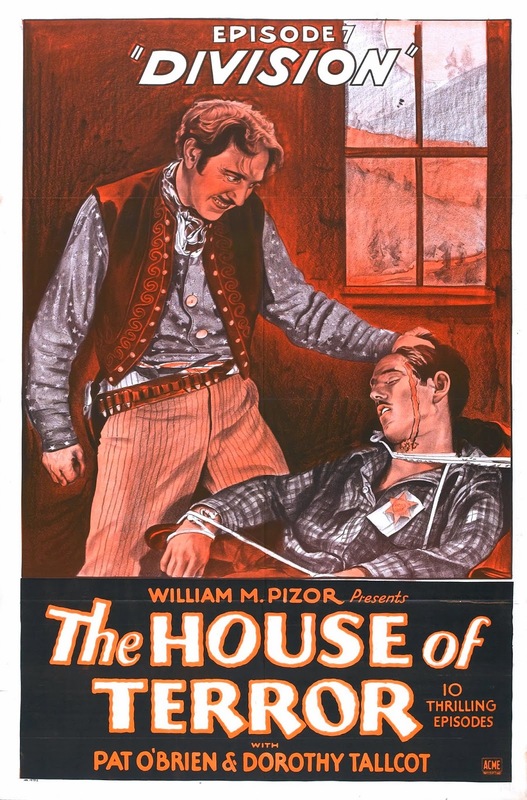 This was the kind of movie I rented like there was no tomorrow back in the day, but I don't think I've seen this one. 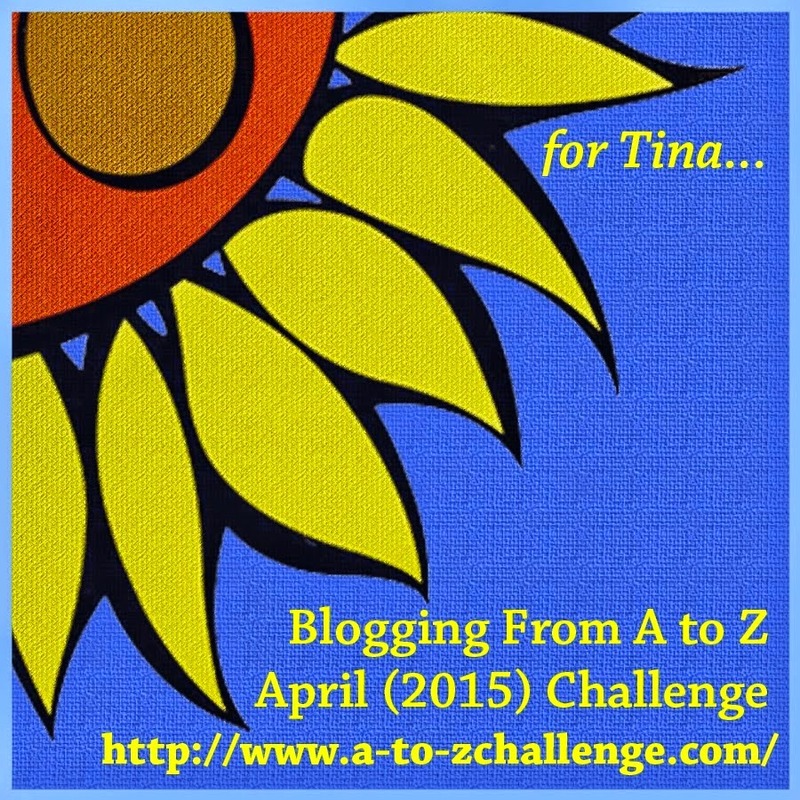 Until tomorrow - kicking off A-Z #4 - you Can Poke Me With A Fork, Cause I Am Outta Here! 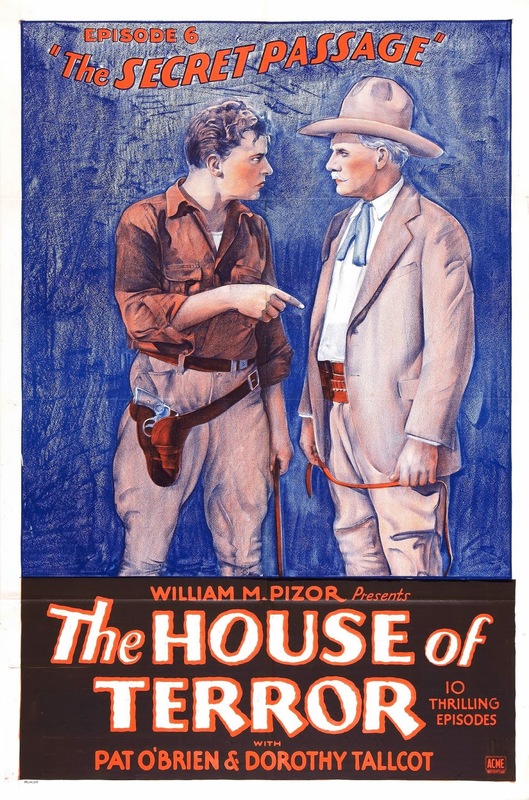 Saturday Night at the Movies 3/29/14! 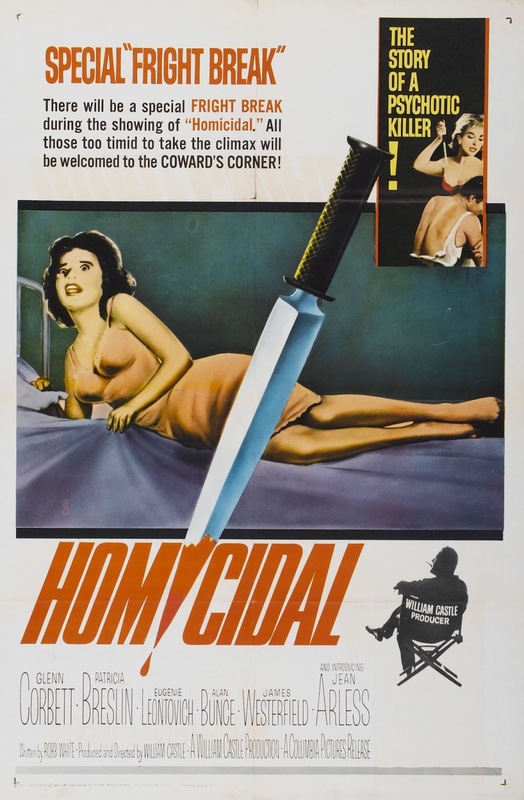 After Alfred Hitchcock's Psycho became such a hit - William Castle decided he wanted in on that action so he called in his usual writer - Robb White - and they cooked up a pretty danged good knockoff. Keeping spoilers at bay - the movie's story at its most basic? A brutal murder uncovers dark family secrets in a small Southern California town, and soon no one is safe from someone who is most decidedly...Homicidal. 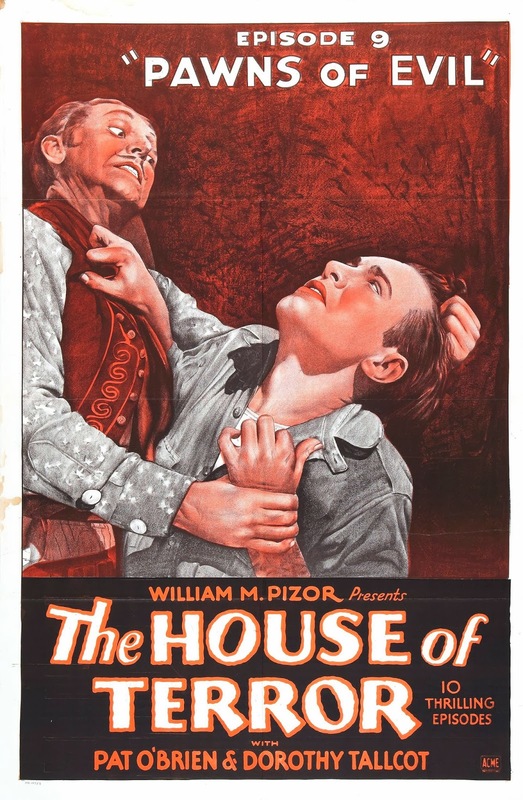 But the one thing no one seems to notice - apparently William Castle wouldn't have minded you thinking his movie was a true followup to Psycho - else why would the narrator of that short trailer above be doing an Alfred Hitchcock impression? William Castle would normally have narrated himself - plus Mr. and Mrs. America were well aware of what Hitchcock sounded like from him hosting Alfred Hitchcock Presents on TV for years by this point. 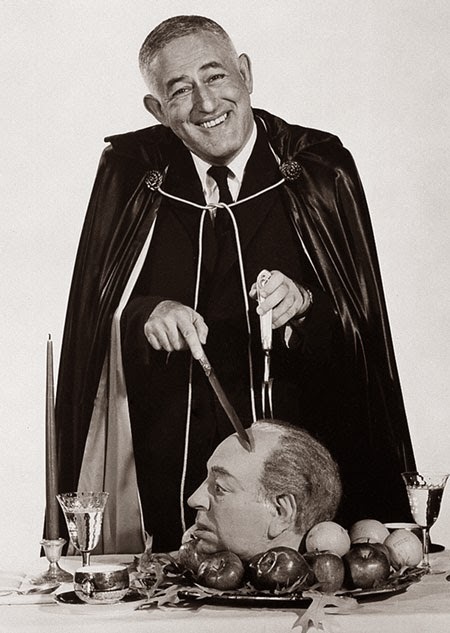 Well played, William Castle! In lieu of a release poster - a cool cast photo. 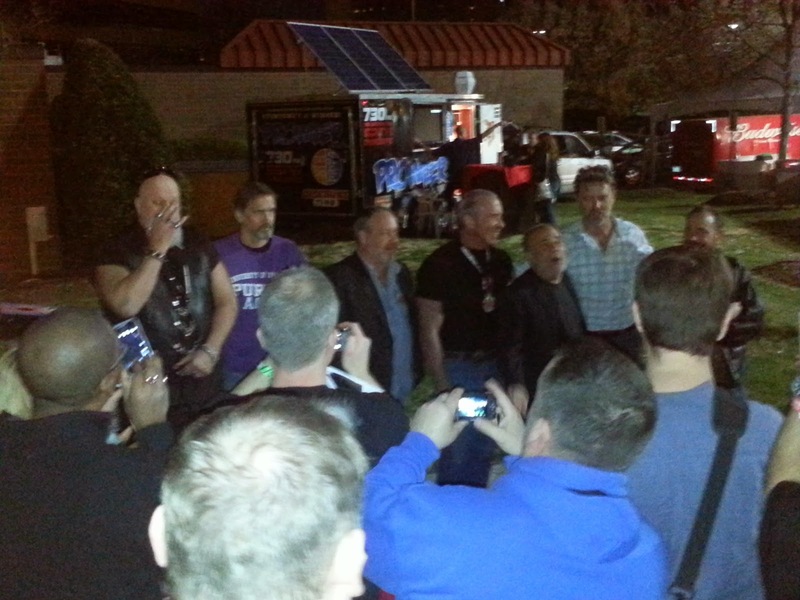 Shanna Forrestall, Kane Hodder, and Malcolm Danare. While attending the 2014 edition of the Mad Monster Party horror convention in Charlotte NC, I was lucky enough to get to attend a special sneak peek screening of John Schneider's upcoming horror comedy. I also got to talk to the writer director about the project. I asked him where the wild idea for the movie's story came from - and he indicated he'd originally gotten the idea 20 years before - just a snippet - what if horror actors - usually employed bumping off young women in movies - were themselves getting bumped off by a little blonde coed? The idea sat on his furthest back burner for more than a decade, until Mr. Schneider found himself at a convention in Germany with Richard Brooker (Friday the 13th Part 3's Jason) and several other horror actors. Watching their interactions with their fans, and spending time with Brooker opened up the story for him, and he actively started working on it - with Brooker on board to lead a cast of famed horror stars - who would be playing exaggerated versions of themselves. Unfortunately, by the time the first draft script was completed, Richard Brooker had passed away. Saddened but undaunted, Schneider proceeded - adding homages to Brooker in the script and offering the lead to Kane Hodder. Hodder said yes and also came on board as an associate producer. They got the money together and shot the movie in Louisiana - and the completed flick saw its first public screening Friday night March 21st, 2014. Kane Hodder, scintillating in the role of "Kane Hodder." Kane Hodder, R.A. Mihailoff, Bill Moseley, Don Shanks, and Malcom Danare are among the celebrities attending a small horror convention on Friday the 13th. Attendance is miserable, so when Hodder pops up with the offer of fast money to use their horror status to "haunt" a trailer park and scare its residents - they jump at the promise of $1000 each. When they arrive they meet their employer - the trailer park's owner - an unpleasant old bat named Agnes (Brassette) - and her much more pleasant (at least to the eye) daughter DD (Grant) - who more than lives up to that name. DD - now it's all clear, right? As the actors prep their movie shtick to do their terrorizing, they start to fall prey to "accidents" that quickly start dwindling their numbers. The tables have turned. They've killed hundreds of people onscreen, but now someone is killing them. Who will survive and what will be left of them? Who thinks this is a good idea? Dane Rhodes and Shanna Forrestall take a late night paddle around the lake. I was kind of surprised when the movie immediately established itself as a very quirky horror comedy - and more surprised when Kane Hodder introduced himself onscreen to another character as...Kane Hodder! This - and every other major character's first appearance - is then underlined with a freeze frame and identifying credit. But what a wild idea - not only are these guys in this movie to provide - and spoof - their horror icon images - but they're doing it as goofier versions of themselves! The script is very funny - with jokey versions of the actors' most famous roles - to keep the lawyers at bay. 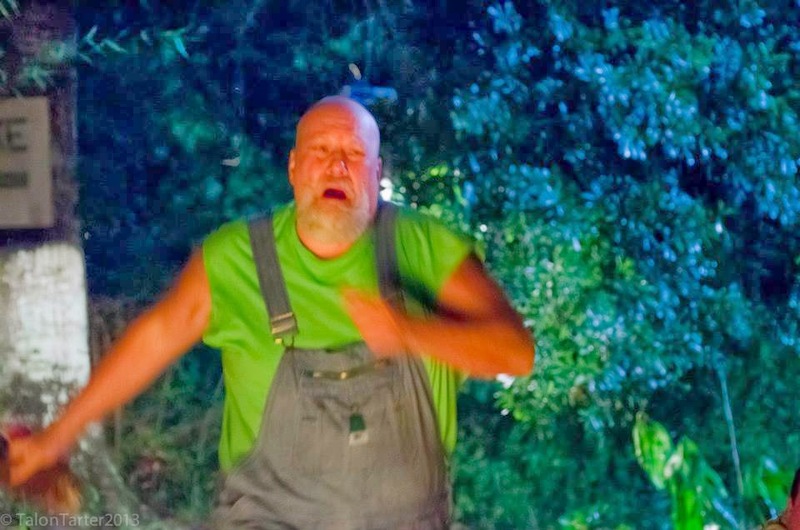 Smothered's Hodder is famous for playing "Mason;" the movie Mihailoff for "Quiltface." Interestingly - Moseley is not playing "Motis" or "Croptop," but is playing "Teddy" - the movie monster with gloves packed with deadly weaponry - and Teddy doesn't settle for one hand and razors - he's got two gloves, with knives, a hypodermic needle, and pistols mounted on his fingers. Hilarious! So, I don't know if they approached Robert Englund and he declined, or if they just really wanted to get a Freddy parody in the movie - but Moseley really makes the most of the spoofy character in the movie. Don Shanks - tearing up the screen as "Don Shanks." Everybody is up for the game - with extra points to Mihailoff for his twist on himself - and it's really nice to see these guys acting without four pounds of latex makeup to shlep around. 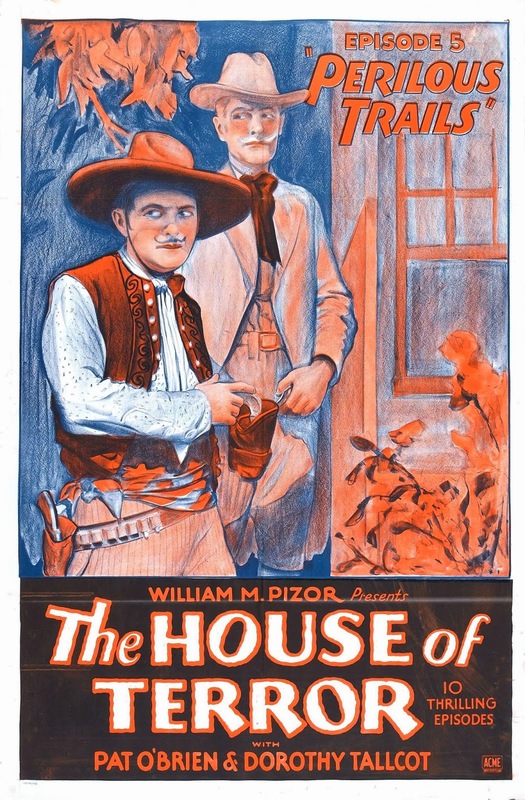 The more familiar actors are also well matched by the supporting cast - with Rhodes, Forrestall, and Grant standing out. Schneider directs well - the movie looks good, especially considering the budget and the amount of night shooting. There are also some very nice makeup and gore effects along the way - and it appears almost all the effects are practical, other than some digital fire. The screening was well attended, and the crowd seemed to really enjoy the movie. I enjoyed it - but I had a major quibble with the editing. The decision was made to go non-linear - with scenes near the end of the storyline appearing early, scenes that set up the story running in the latter part of the movie, and constant jumps back and forth in time. I can get behind this in some movies - but it had a negative effect here. People die, then continue appearing in the movie as the story jumps back to the previous day. This actually takes away from their death scene. We see a moment from near the end very (too) early on, and it subtracts from the scene's impact when it comes back around. And the setup of the plot - which is not kept under wraps for any "surprise the audience" reasons (the actors and Schneider talked about it to me and in interviews) - occurs in the last half hour. These three points did not work in the movie's favor. I think the technique could still be used, it just needs to be reined in a lot. But others may find the jumping around working to the movie's advantage. Yes, it's in there - but I don't even have a rough time code. I'll amend this with who said it and when after seeing it again. Welcome to the list, ladies! than some conventions I've been to!" 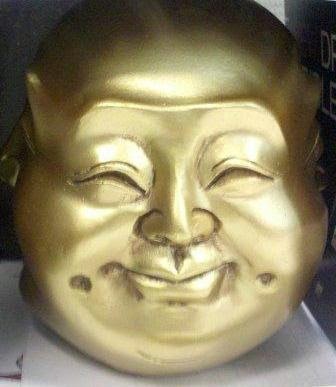 Thank you Buddha Man! Until next post, you Can Poke Me With A Fork, Cause I Am Outta Here! Maniacal Movie Poster Monday #160! 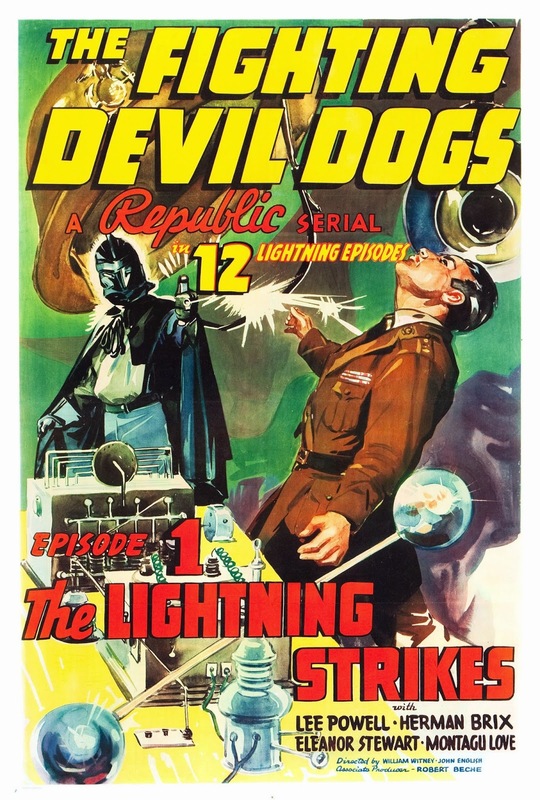 I do love the classic serials - and I'm thrilled that so many of them are now available on home video - and at affordable prices! I've got a couple dozen of them in the video vault! Until next post, you Can Poke Me With A Cliffhanger, Cause I Am Outta Here! 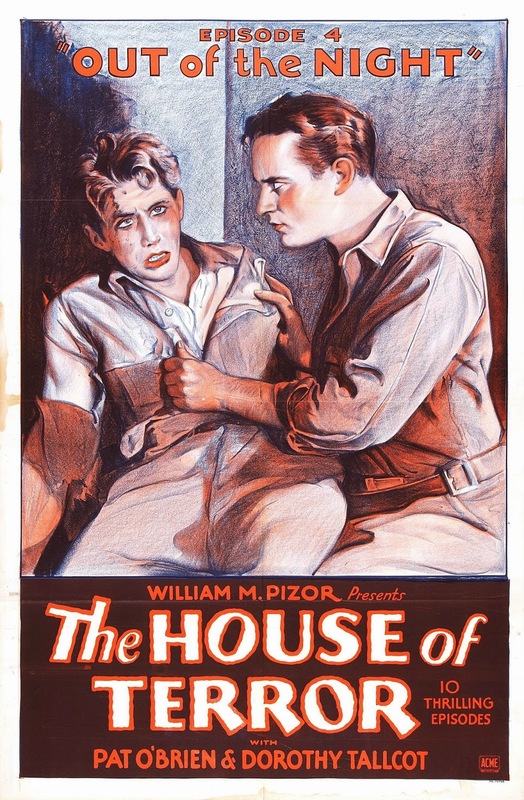 Saturday Night at the Movies 3/22/14! 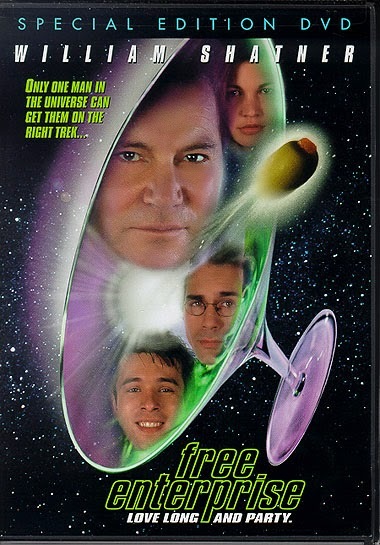 This is a cute movie, although co-writer Mark Altman still owes me money for that Paul Winfield interview. But the whole show here is The Shat - playing a slightly loonier version of himself - and proving to be another former leading man whose appeal grows even further when he starts to take himself less seriously and poke fun at his image. I have this very edition of the DVD - and we could be spinning it at anytime you felt like coming to see it with me - even tonight. I Was A Teenage Production Assistant: Other Stuff Volume 1! Dotted in amongst my production work, I would still work as a background extra now and again for some extra cash in 1993. At some point in your climb up the film industry ladder you need to stop doing extra work (except under one circumstance, which I’ll get to in a bit.). The reason you need to stop doing it is – extras are not highly regarded by crew members. Some of this is for valid reasons – a person can be smart; people can be dumb. The larger the group, the more likely the IQ will be lowered. Crew members also are not fond of extras who work often and act like they are important because they walked down the street (with fifty other people) behind Tom Cruise in some movie (see how I keep themes going across these posts?) Consequently there are crew members who refer to extras as meat puppets (usually not in front of them, at least). So, whatever reputation you gain being a hard working crew member can be compromised if you keep popping up every other show as an extra. You simply lose ground for one, and for two the harsher crew members will wonder why you couldn’t get a crew job. But early on – when you’re still getting day work as a PA (when a show hires you to work only a day or two – big days with lots of extras, or something that is complicating the production process) and only occasionally getting the run of a show you can still get away with extra work. The other circumstance where you can still do extra work as a seasoned film crew member and it doesn’t reflect badly on you? If you have family or friends visit from out of town and you are between jobs and want to show them what you do and the “glamor” of the biz. It helps to have a nice easy TV show like Matlock shooting in town for this, let me tell you – and I did this more than once. 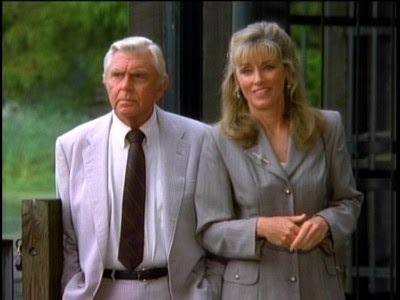 Matlock was the second really suuccesful show for Andy Griffith. 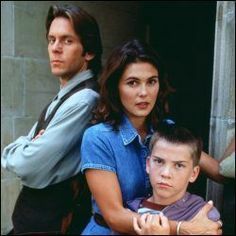 He played a good ol boy Georgia lawyer with more on the ball than he let on - and the show had been on NBC for six seasons. When the ratings dipped NBC decided to let the show go. ABC then decided to give the show a try to see how their ratings would be. With the move to a new network they also decided to bring the show to Wilmington NC as this was just a couple of hours' ride from Andy Griffith's home in the Outer Banks and made for less travel for him. 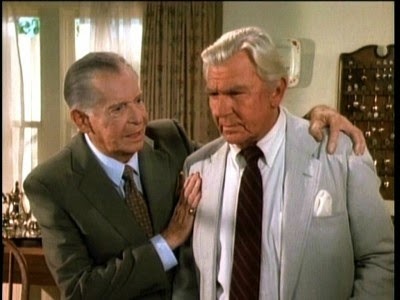 Matlock was very civilized because Andy Griffith was a TV Legend and carried a lot of power as the star and as a producer on the show. Consequently they catered to his wishes in a lot of things that lesser TV stars don’t get. He liked to work early quickly, and he never wanted to work past five. 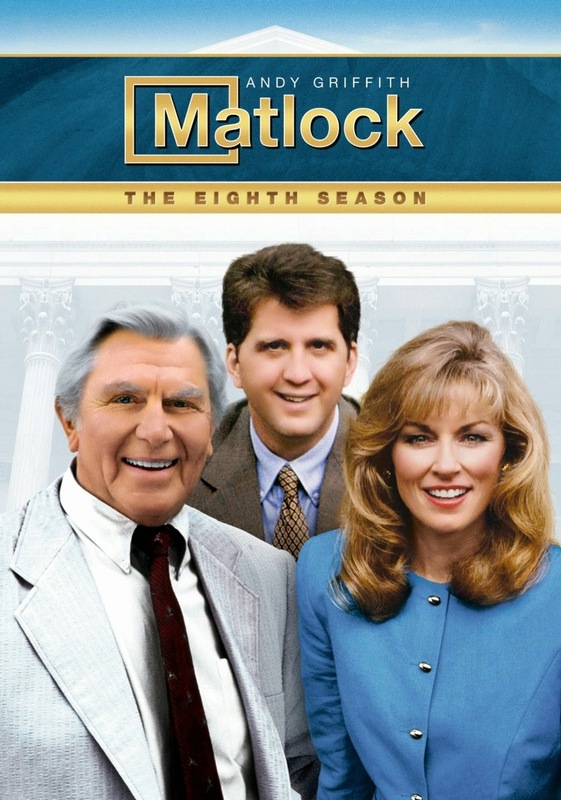 So, when there were days with pretty much only scenes with lots of Matlock (like the courtroom stuff, which always featured him) then you were in good shape because they always needed forty or fifty extras for those scenes (jury and observers) and you pretty much knew you were going to get off work around five o’clock. Andy Griffith and Brynn Thayer. It’s interesting when your star doesn’t want to work after dark – suddenly their character is featured in far fewer night scenes – and the few they are still needed for are usually faked and shot in the day time. For example, whenever Ben Matlock is out meeting people and investigating – it’s always day. 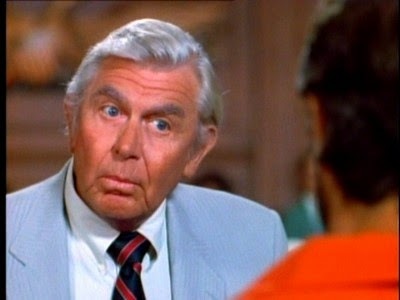 Then, in one or two episodes a season, maybe the opposing counsel comes to see Matlock in the middle of the night – well, here would be Andy in his robe with his hair mussed and all out of sorts at being dragged out of bed – but that scene would be shot on his house set in the full bloom of day – entirely inside a soundstage – with the darkness of night faked through lighting tricks. Andy's home eating dinner and we're still shooting! On good days Andy could be very pleasant – but there were a couple of times where he was in a cranky mood – and he was not the folksy good ol’ boy people remembered from Mayberry. He hated to be fussed over by makeup and hair – he would allow them 15-20 seconds – but if they went longer than that he might snap at them to let him be. He also was not wardrobe’s best friend. 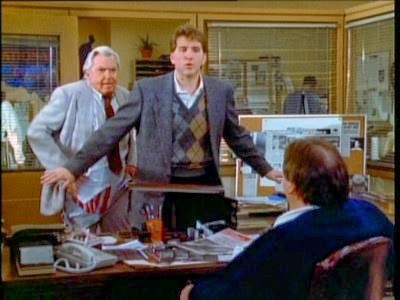 Ben Matlock wore the same cheap suit all of the time – but as soon as the shot was cut and printed – meaning the crew would be moving on to a new shot – Andy wanted out of that suit jacket. He wanted the young lady attending wardrobe on set to be standing beside him seconds after the shot was printed. If she was there he would hand off the jacket and walk away. But, as I saw more than once - if anything delayed the wardrobe assistant from getting there – he would wait, holding the jacket for a few seconds – then he would simply drop the jacket on the floor and walk away. This would mean the wardrobe girl would have to run to grab it – then brush it off and shake it out before hanging it up. I understand you’re a big time TV star and wardrobe should be standing there to take the jacket – but things happen on set – people can’t always be everywhere at once. He could have stepped over to his cast chair and laid it neatly over the chair and let her retrieve it from there – but no, he would drop it on the floor. Weirdly, he didn’t care if the extras saw this happening – and there would always be a lot of negative buzz among them when he did it. He could also get grabby with the girls of makeup hair and wardrobe – little pinches and such. And again, he would do this on the courtroom set with dozens of extras witnessing. Keep in mind this was him at his worst – and he was nowhere near the meanest or worst person I saw in my career. And there were times when he’d be as pleasant and charming as could be. But it was a little weird to see this icon known for playing one of the nicest guys on television showing his feet of clay. I worked on probably a dozen or so Matlocks over the three years it was shooting here in Wilmington. Half of those were one day in-and-out extra jobs by myself that have not stuck in my memory in any way. The other five or six have stuck in my memory – either because I was there with guests or because of the guest stars in that particular episode. 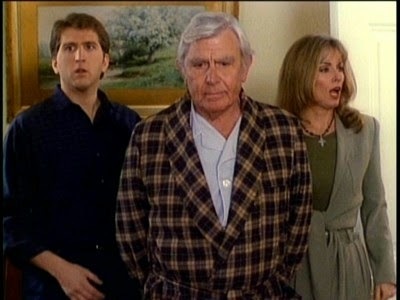 The very first Matlock I did was an episode called The Class which sticks in my mind because at one point the camera pans across a table of people, and I’m sitting with my back to camera – and it was the very first indication I had of how thin my hair was getting on the crown of my head. Actually really bothered me back then. 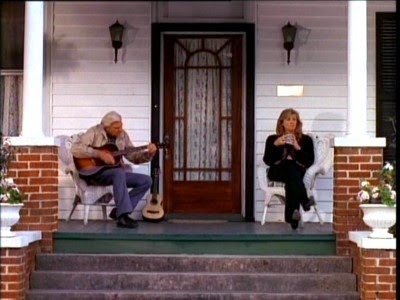 There was also a pleasant afternoon during the shoot listening to Andy Griffith play guitar and sing – something he LOVED to do – and something he would do between setups sometimes – it was really very cool. The Defendant In this episode I was chosen to be a press photographer in a charity ball sequence. The director of this episode was Leo Penn (Father of Sean and Chris). He actually directed me (usually extras are directed by the assistant directors – this is actually part of a SAG rule that says if the production’s director is the one directing someone that someone can become eligible for SAG and might need to be paid SAG wages for their work – MUCH more money. I don’t know if they thought we wouldn’t know about that stuff way over on the East Coast – or just didn’t want to intrude on 70-something Penn’s process – but some of my actions fed off of and led to some of the actors’ movements and dialogue – so Leo directed me.) It was very cool. The guest star that week was Richard Gilliland – who was on TV constantly in the 80’s and 90’s. 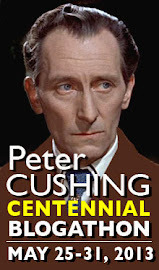 He was very pleasant and we had a nice conversation about a sitcom he’d done with actor TC Carter - Just Our Luck, which was one I really enjoyed for its brief 13 episode run. He seemed impressed that I was reeling off episode details – proving I really was a fan. The nicest thing about this episode was that my parents and grandmas got to actually see me onscreen for a few seconds – as up to this point all of my work was behind the scenes and I hadn’t even been screen credited on anything but The Birds II: Land's End – which only my parents watched. The Fatal Seduction was a two parter - and I was in a beach scene and a courtroom scene on this one - the beach scene sticks out in my mind as it featured Jeri (7 of 9) Ryan in a bikini. It was also cool to meet Rob Stone - who'd played eldest brother Kevin on one of my favorite 80's sitcoms - Mr. Belvedere. Yeah, it was a tough day at work. The Last Laugh was an amazing episode - I got to work with Milton Berle! The man was 80-something and sharp as a tack - trading barbs with the cast and crew between setups - he was utterly fantastic. I am particularly spottable in this episode too - near the end of the episode when a triumphant Uncle Milty returns to the stage - I am front and center in the reaction crowd shots - laughing like there's no tomorrow. Uncle Milty, meet Sheriff Taylor. 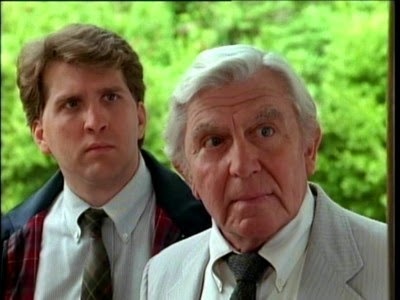 The other really cool aspect of Matlock being here - I became friends with third lead Daniel Roebuck. I met him during one of the episodes I was an extra on. Months later, I came back for some more extra work, and he remembered me - by name! That's rare. Dan also took the time to introduce himself to my parents when they did extra work on the show. I ended up interviewing Dan three different times in the time he was here - twice for the local entertainment guide I worked for and once for Psychotronic Video magazine. During this time I discovered that he too was a Monster Kid - a few years older than me, but with the same experiences watching the Universal Studios Monsters on local TV stations growing up. Consequently we started to hang out some - I first saw the original Old Dark House on VHS at his house - and we once had an awesome night with a group over at Dan's watching several Super 8mm condensed edits of some of the Universal classics. Great guy, with a wonderful wife - Kelly- and kids - Buster and Grace. Linda was a USA World Premiere movie that shot here in 1993. It was based on a book by John D. McDonald, and had been filmed previously in 1973 as another TV movie with Stella Stevens in the title role. This time it was Virginia Madsen, and she was supported by Richard Thomas, Ted McGinley, and Laura Harrington. I was needing some work - and money - so I signed on for a single day of extra work playing a news photographer (again - my degree in cinema and photography must show on my face!). A small group of photographers watches as the police investigate a dead body on the beach. 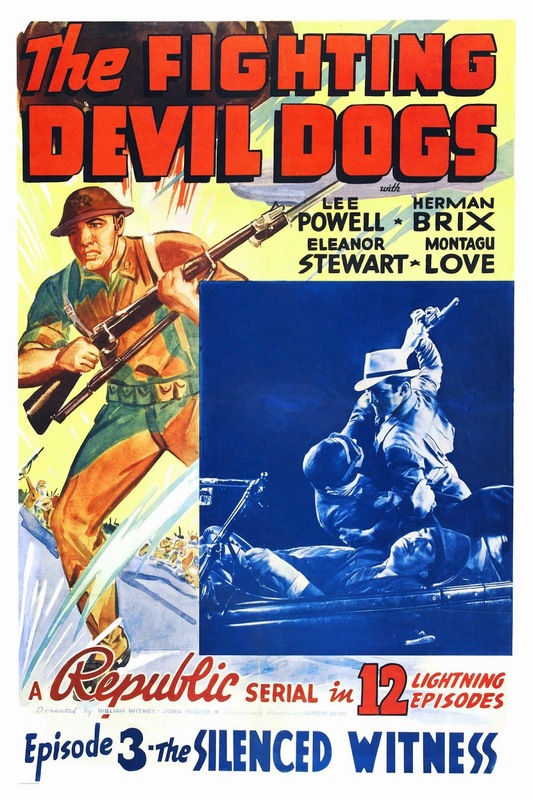 This is a cool little flick, and I'm not going to spoil any of the rest of the plot - in case you do get a chance to see it. If you do - you can definitely spot me snapping away in the scene I describe above. It was a very pleasant shoot - nice day, beach, and four amiable actors who stayed around chatting between shots. I had a good time - I know it was just the one day - but it was a good one - and I'm very spottable in the movie - so it rates a mention here. Next up for this department will be another pair of quickies - a feature film that shows you can be too young to direct; and another TV miniseries. Maniacal Movie Poster Monday #159! Saturday Night at the Movies 3/15/14! 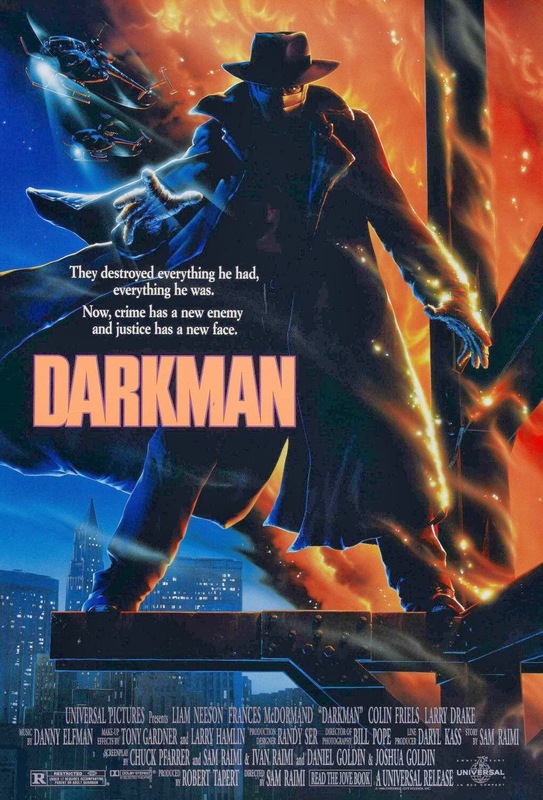 I have to admit I didn't get what I was expecting when I sat down in a theater in 1990 to watch Sam Raimi's (relatively) big budget superhero movie. It had been advertised as a very dark toned movie, but what I saw was a crazed burst of Raimian energy, with tongue in cheek and visual style to spare. In other words, I was expecting Evil Dead and got Evil Dead II. Consequently I was a little...I won't say disappointed...but I definitely did not have the movie experience I was expecting. Saturday Night at the Movies Triple Feature! Four or five years after the first movie, Sam Raimi's production company geared up the first of two sequels - shot back to back to save costs. Raimi turned over the directorial reins to cinematographer Bradford May; and Liam Neeson - whose star had considerably risen after movies like Schindler's List - declined to return, and the lead acting reins were turned over to South African actor Arnold Vosloo. 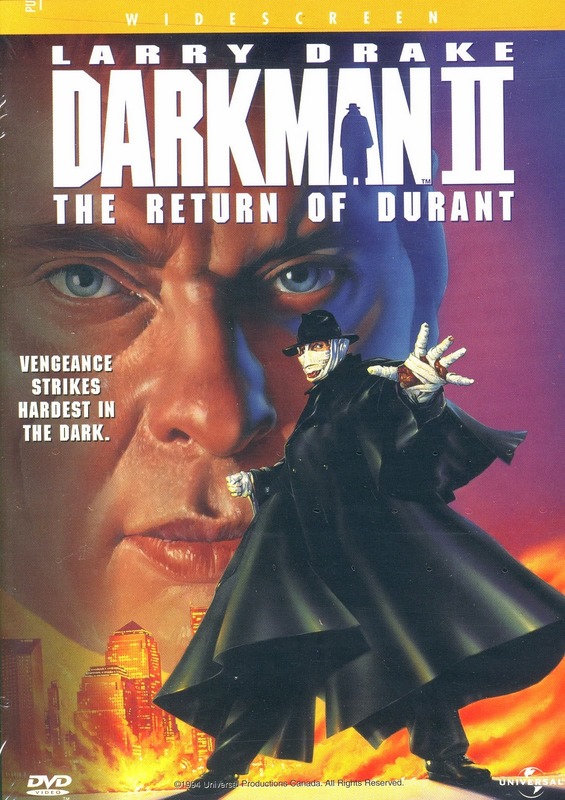 Encoring villain Larry Drake takes top billing, but at least they gave Arnold "and...Arnold Vosloo as Darkman" credit. And let's plunge into feature three! 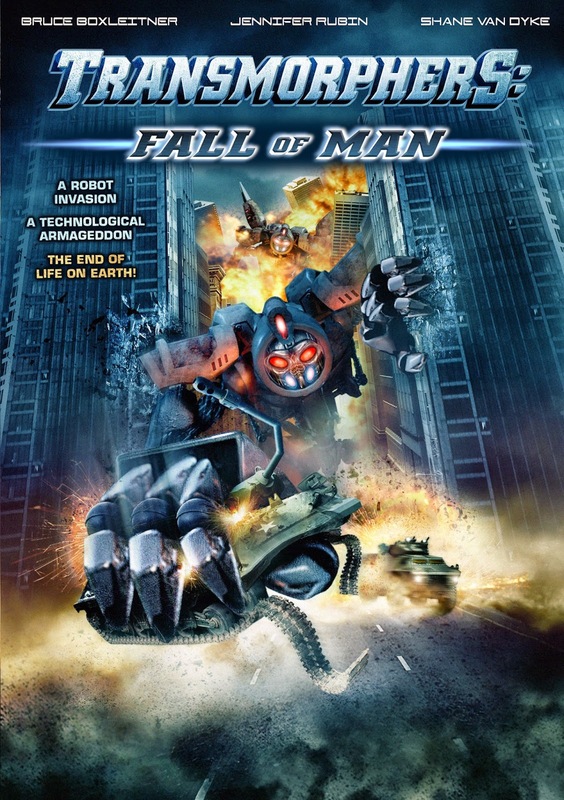 I have only seen this one once - I found it the least of the movies, despite the presence of Jeff Fahey and Darlanne Fluegel as the villains. Still, I am a completist, and I'm sure it's probably better than I remember it being. 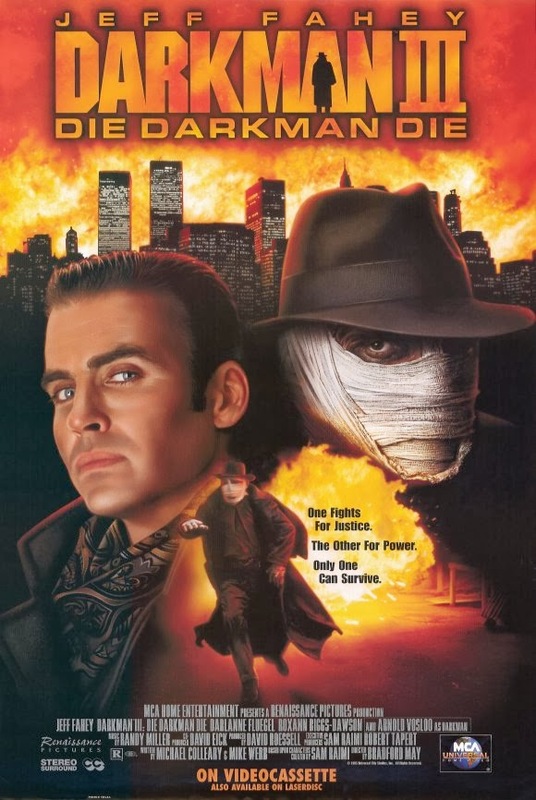 There was a one-shot one hour Darkman TV pilot made, but I've never managed to see it. In any case, I have all three of the movies in a nice Universal Studios Franchise Pack and we could be getting this mini film festival going at any time - even tonight, if you cared to come check it out with me! Vic Armstrong is in there somewhere! He doubled Roger Moore during his Bond tenure. He handled some of Superman's biggest stunts for Christopher Reeve. 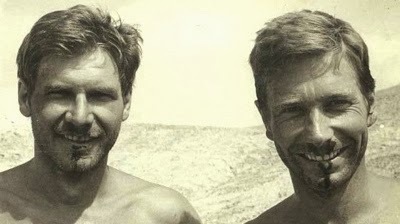 He was such a good double for Harrison Ford in the Indiana Jones movies people would mix them up on set. That's Vic on the left. Er, right. Since then he's coordinated the stunt teams for big movies; and moved in to directing - both second unit and stunts, and feature films like Army of One with Dolph Lundgren. 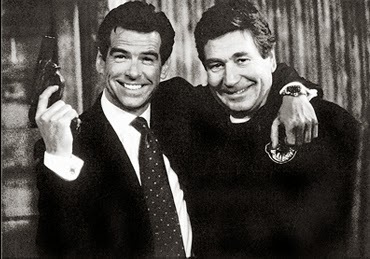 Vic worked on three of the four Pierce Brosnan 007 movies. 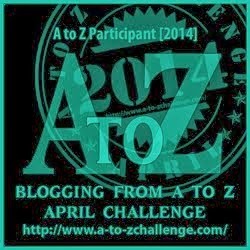 One other thing: Vic Armstrong knows good blogging when he sees it too. Maniacal Movie Poster Monday #158! Saturday Night at the Movies 3/8/14! Maniacal Movie Poster Monday #157! Saturday Night at the Movies 3/1/14!